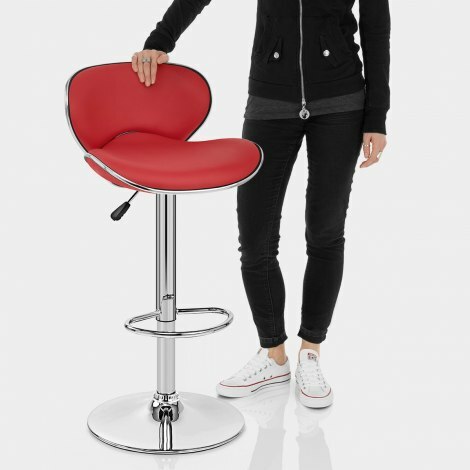 The Duo Bar Stool Red is a modern masterpiece, with a bold and vibrant aesthetic that will make for a show stopping statement in your home. A compelling and contemporary design, the Duo is perfect for those who crave a bar area with a difference. 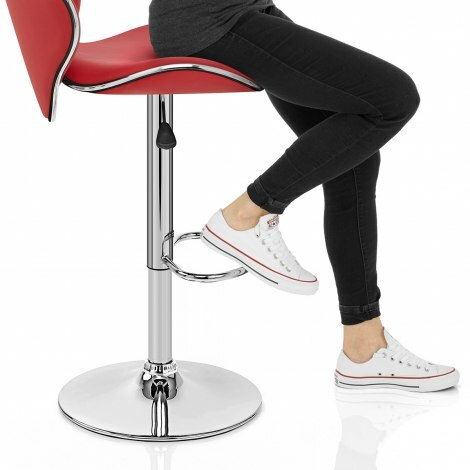 It features a superbly comfortable seat that is well padded for excellent comfort and covered in striking red faux leather. 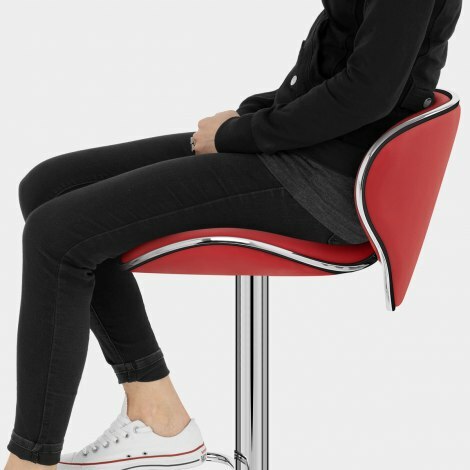 The wide, accommodating seat rises on two sides and is echoed in the backrest, which provides good support for the lower and mid back. The bottom of the backrest extends downwards past the seat to give a more imposing profile and to add to the visual detail. A chrome trim also runs around the edges of the seat and backrest. Matching perfectly with the seat trim is the chromed footrest and stem. In the stem is housed the adjustable height gas lift and 360-degree swivel mechanism. These allow it to raise, lower and rotate, making it perfect around the home, especially in a kitchen or breakfast bar. A circular base with a rubber ring beneath keeps it stable and also helps to protect your floor from any scratches. "They look the part and were a great price"
We bought 2 of these for a quirky contemporary house we are building. They look fabulous, were easy to assemble and delivered promptly. We haven't had much chance to test them though, but the quality looks fine. Very good wearing stools. Had some 2 years already and a friend is about to order some for herself. Really pleased with the bar stools good quality very stirdy and very good costomer service. Really pleased with the stools, they were just what we wanted.